We also uncovered some good benchmark data in this report related to specific activities that we perform for our EDU clients. Many of our engagements start with developing in-depth student personas. As part of this exercise, we begin to understand how the prospective students view the “brand” of a particular college or university. In some cases, the perception of the school’s brand by the prospective student is not inline with the brand as seen through the eyes of the admissions team. In cases like this more time and effort needs to be dedicated towards a branding strategy process. This report indicates that this process can take 9 to 15 months and cost between $100,000 and $200,000. Finally, this report states that “higher education institutions are relying more on marketing automation to establish and maintain meaningful relationships with students and alumni.” Today’s marketing automation software has many powerful features and functions. The chart below lists the key benefits from the users perspective. 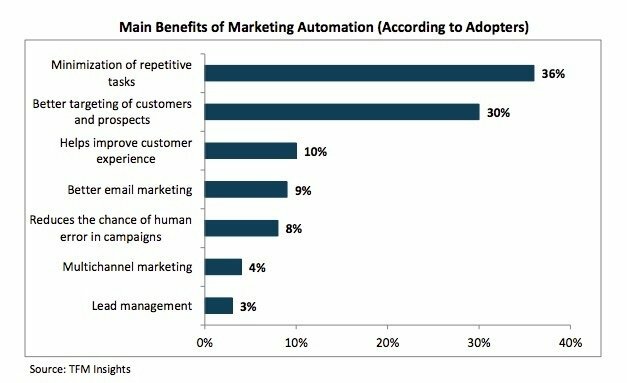 While the above benefits are more around process issues, we believe that marketing automation combined with the right integrated, multi-channel marketing stratetgy will allow higher education institutions to deliver personalized communications to prospective students. As we all know it is about community and engagement that prospective students are looking for when they start the college search process.